It's been a long time since I posted anything on this blog, mainly because my job has been keeping me very busy. As time permits I've been reading parts of the LuaTeX source code in an attempt to better understand how it all works: cross-referencing the source code to explanations in the LuaTeX Reference. 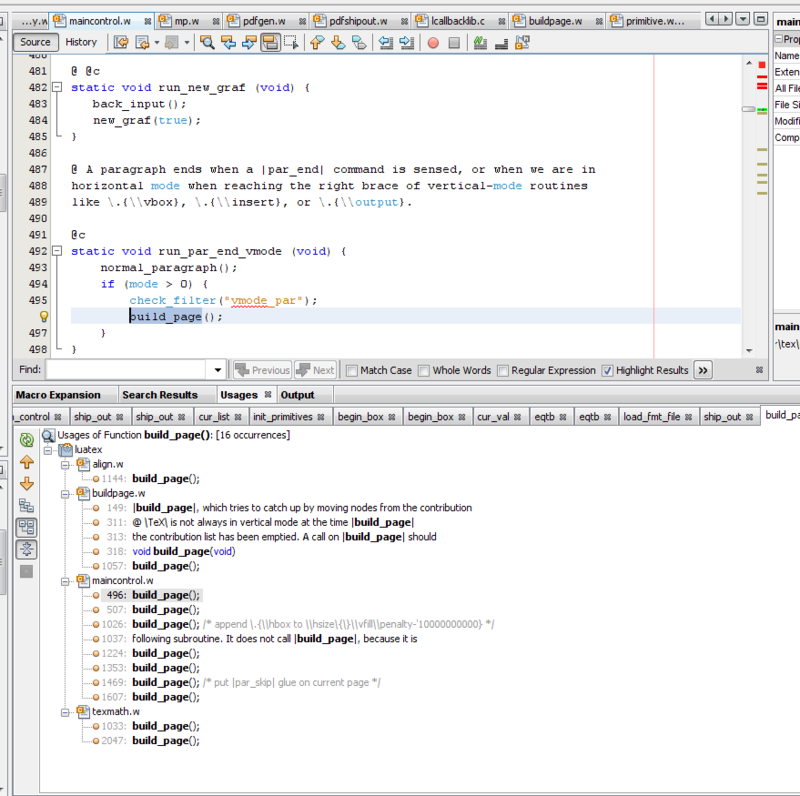 A couple of days ago I stumbled on the NetBeans IDE – a free Integrated Development Environment. I was interested to see that NetBeans has a Subversion Checkout Wizard (i.e., built-in SVN capabilities), so you can checkout a copy of the LuaTeX code repository and import it directly into NetBeans as a new project. So, I downloaded NetBeans (with C/C++ support) and checked out a copy of the LuaTeX code base, directly from within NetBeans. After completing the download, NetBeans automatically imported the LuaTeX code to create a new project. Very nice! However, I have not tried to build LuaTeX using NetBeans (because I need to understand more about the build process) but I have found that it provides excellent tools to search and browse the source code, allowing you to very quickly explore and probe some of the deeper mysteries of TeX. Much of the LuaTeX code base is written in CWEB (integrated C source code and documentation); consequently, many of the source files have a .w extension. You'll need to configure NetBeans to tell it about .w files: see Tools --> Options --> Miscellaneous. Here's a screenshot showing a search for the build_page() function, part of TeX's page-building machinery, showing you where and when TeX exercises the page builder.